Lincoln awoke the morning of April 14 in a pleasant mood. Robert E. Lee had surrendered several days before to Ulysses Grant, and now Lincoln was awaiting word from North Carolina on the surrender of Joseph E. Johnston. The morning papers carried the announcement that the president and his wife would be attending the comedy, Our American Cousin, at Ford's Theater that evening with General Grant and his wife. shortly after his election in 1860. 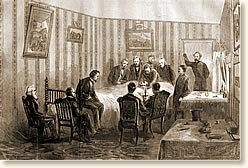 At 11 that morning, Lincoln held a meeting with Grant and the Cabinet. After the meeting broke up, Grant gave his regrets that he and his wife could no longer attend the play that evening. Secretary of War Edwin Stanton pleaded with the president not to go out at night, fearful that some rebel might try to shoot him in the street. At lunch he told his wife the news about the Grants, and that he was reluctant to go. Pressing him to maintain their announced plans, they asked Major Henry Rathbone and his fiancee, Clara Harris, to join them. After an afternoon carriage ride and dinner, Mary complained of a headache and considered not going after all. Lincoln commented that he was feeling a bit tired himself, but he needed a laugh and was intent on going with or without her. She relented. He made a quick trip to the War Department with his body guard, William Crook, but there was no news from North Carolina. 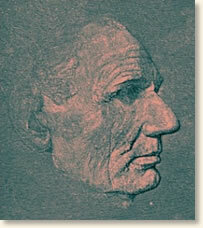 While returning to pick up Mary, Crook "almost begged" Lincoln not to go to the theater. He then asked if he could go along as an extra guard. Lincoln rejected both suggestions, shrugging off Crook's fears of assassination. Lincoln knew that a guard would be posted outside their "state box" at the theater. Arriving after the play had started, the two couples swept up the stairs and into their seats. The box door was closed, but not locked. As the play progressed, police guard John Parker, a notorious drinker, left his post in the hallway leading to the box and went across the street for a drink. During the third act, the President and Mrs. Lincoln drew closer together, holding hands while enjoying the play. Behind them, the door opened and a man stepped into the box. Pointing a derringer at the back of Lincoln's head, he pulled the trigger. Mary reached out to her slumping husband and began shrieking. Now wielding a dagger, the man yelled, "Sic semper tyrannis!" ("Thus always to tyrants"), slashed Rathbone's arm open to the bone, and then leapt from the box. Catching his spur in a flag, he crashed to the stage, breaking his left shin in the fall. Rathbone and Harris both yelled for someone to stop him, but he escaped out the back stage door. An unconscious Lincoln was carried across the street to the Petersen House and into the room of a War Department clerk. The bullet had entered behind the left ear and ripped a path through the left side of his brain, mortally wounding him. He died the next morning. "The President had been carried across the street from the theater to the house of a Mr. Peterson. We entered by ascending a flight of steps above the basement and passing through a long hall to the rear, where the President lay extended on a bed, breathing heavily. Several surgeons were present, at least six, I should think more. Among them I was glad to observe Doctor Hall, who, however, soon left. I inquired of Doctor Hall, as I entered, the true condition of the President. He replied the President was dead to all intents, although he might live three hours or perhaps longer. The giant sufferer lay extended diagonally across the bed, which was not long enough for him. He had been stripped of his clothes. His large arms, which were occasionally exposed, were of a size which one would scarce have expected from his spare appearance. His slow, full respiration lifted the clothes with each breath that he took. His features were calm and striking. I had never seen them appear to better advantage than for the first hour, perhaps, that I was there. After that his right eye began to swell and that part of his face became discolored. Senator Sumner was there, I think, when I entered. If not he came in soon after, as did Speaker Colfax, Mr. Secretary McCulloch, and the other members of the cabinet, with the exception of Mr. Seward. A double guard was stationed at the door and on the sidewalk to repress the crowd, which was of course highly excited and anxious. The room was small and overcrowded. The surgeons and members of the cabinet were as many as should have been in the room, but there were many more, and the hall and other rooms in the front or main house were full. One of these rooms was occupied by Mrs. Lincoln and her attendants, with Miss Harris. Mrs. Dixon and Mrs. Kinney came to her about twelve o'clock. About once an hour Mrs. Lincoln would repair to the bedside of her dying husband and with lamentation and tears remain until overcome by emotion. A door which opened upon a porch or gallery, and also the windows, were kept open for fresh air. The night was dark, cloudy, and damp, and about six it began to rain. I remained in the room until then without sitting or leaving it, when, there being a vacant chair which some one left at the foot of the bed, I occupied it for nearly two hours, listening to the heavy groans and witnessing the wasting life of the good and great man who was expiring before me. About 6 A.M. I experienced a feeling of faintness, and for the first time after entering the room a little past eleven I left it and the house and took a short walk in the open air. It was a dark and gloomy morning, and rain set in before I returned to the house some fifteen minutes later. Large groups of people were gathered every few rods, all anxious and solicitous. Some one or more from each group stepped forward as I passed to inquire into the condition of the President and to ask if there was no hope. Intense grief was on every countenance when I replied that the President could survive but a short time. The colored people especially-and there were at this time more of them, perhaps, than of whites - were overwhelmed with grief. A little before seven I went into the room where the dying President was rapidly drawing near the closing moments. His wife soon after made her last visit to him. The death struggle had begun. Robert, his son, stood with several others at the head of the bed. He, bore himself well but on two occasions gave way to overpowering grief and sobbed aloud, turning his head and leaning on the shoulder of Senator Sumner. The respiration of the President became suspended at intervals and at last entirely ceased at twenty-two minutes past seven"
Morse, John T. (editor), The Diary of Gideon Welles (1911); Panati, Charles. Panati's Extraordinary Endings of Practically Everything and Everybody (1988); Stephen B. With Malice toward None: The Life of Abraham Lincoln (1977). "The Death of President Lincoln, 1865," EyeWitness to History, www.eyewitnesstohistory.com (1999, revised, 2009). A few days before his death, Lincoln told his wife of a dream he had in which he saw a funeral in the White House. "Who is dead," he asked of a soldier. "The President, killed by an assassin!" was the soldier's reply.